Turkey’s grand sports club Galatasaray achieved to break the „Loudest Crowd Roar at a Sport Stadium“ record with the help of all its fans and followers. Turkey is a country of football and everybody shares the football passion so it is almost certain that this event will take its distinguished place in the history of football. 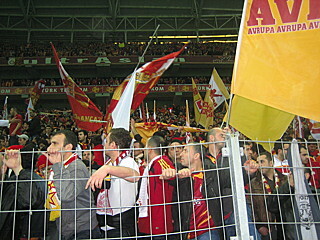 On 18 March 2011, at Galatasaray’s brand new stadium, Ali Sami Yen Sport Complex Türk Telekom Arena in Istanbul, Turkey, the sports club attempted to break the „Loudest Crowd Roar at a Sport Stadium“ record. I witnessed the record attempt as the Guinness World Records Adjudicator, and made sure everything was conducted according to the Guinness World Records guidelines. 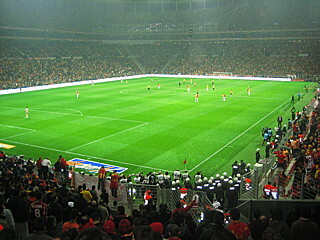 This was a remarkable game as it was the first derby taking place in Galatasaray’s new stadium, playing against the club’s eternal rival, Fenerbahce. 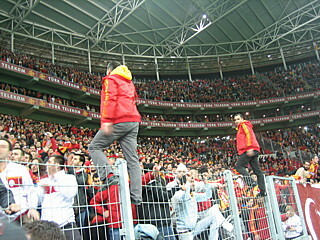 According to the information I received, there were 49,488 Galatasaray fans and 2,500 Fenerbahce fans. So the total number of people was 51.988. Breathtaking! I arrived at the stadium around 19:00 pm and everything was already set up. According to the Guinness World Records guidelines, the sound level produced had to be measured on a Class 1 precision measuring noise level meter, certified and calibrated. I checked the noise level meter myself then we were all ready for the historic record attempt.I have been the adjudicator of many record attempts but rarely in life, could one see so many people in one place. 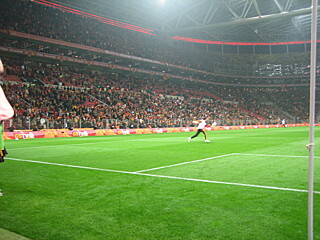 The new Ali Sami Yen Sport Complex Türk Telekom Arena is exquisite and very well constructed. 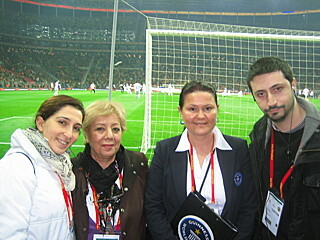 It was inevitable to feel that men were more interested in football than women, when I saw so many of them together. I felt like I was in a totally different world, an entirely different atmosphere. 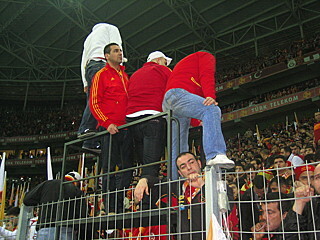 Galatasaray fans had 3 chances for the attempt, and knowing this, they were quite noisy and joyful. They were dancing, performing shows and singing songs to support their team. One remarkable thing was that all the football players wore a special t-shirt while they were warming up for the game. On the t-shirt, you could see the writing “We share your pain,” in Japanese. I congratulate them all for this thoughtful behaviour. 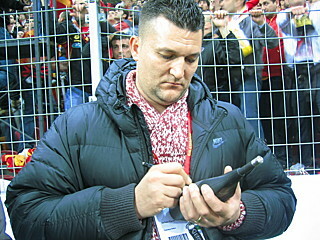 According to the Guinness World Records guidelines, the measurement had to be made on the side line of the game field and there had to be a sound engineer as a witness. The distance to the crowd had to be at least 2 meters. The first attempt was made at 20:50 pm, with 112.08 dBA. The second attempt, at 21:03 pm, resulted in 130.55 dBA. And finally, on the third attempt, at 21:15 pm, a peak reading of 131.76 dBA was recorded. The current record belonged to the United States of America. A peak reading of 128.7 dBA was recorded during the Denver Broncos v. New England Patriots NFL game in Denver, Colorado, USA on 1 October 2000. 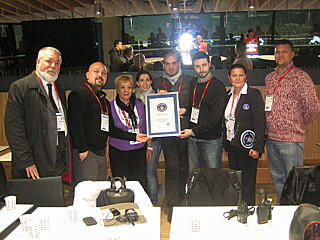 And now the new holder of the record is the Turkish Galatasaray Sport Club with 131.76 dBA. Hearing the results, the crowd in the stadium exclaimed and danced with happiness. Some of them even took off their shirts with joy, despite the sharp cold weather. The organisation committee received the record certificate from me with honour. Congratulations Galatasaray, “cim bom bom”! Largest dog biscuit achieved in Joplin, Missouri! Longest ramp jump by a remote controlled car broken in Stoneboro, PA! Flagging notifies the Guinness World Records webmaster of inappropriate content. Please flag any messages that violate the Terms of Service. Please include a short explanation why you're flagging this message. Thank you! If you believe this content violates the Terms of Service, please write a short description why. Thank you. Or, you can forward this blog with your own email application.